Full details for the latest book (2006) by Leslie Melville entitled "Magictales". 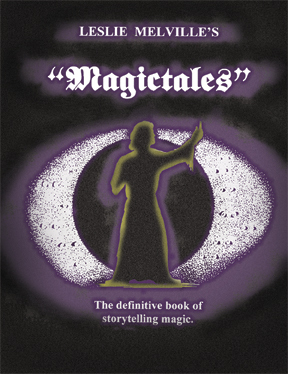 The Definitive Book of Storytelling Magic! Do you want to learn entertaining routines that don't require knuckle-busting sleights or complicated mechanical equipment? You will find all of the above in Leslie Melville's new book, entitled: ‘MAGICTALES’ – The Definitive Book of Storytelling Magic! Author of the recently acclaimed book, “Kismet or the Enchanted Stepping Stones!” Leslie has written another, more comprehensive work in the field of Storytelling Magic! "A Young Man's Meeting With Death!" (An easy to do card trick). (A comic rhyming routine for the Slydini Pins). In addition, there are items that I have been performing over a number of years as ‘special one-off’ presentations that don’t always fit into a regular performance, but do have high impact value on the occasions in which they are presented! There is a chapter on Stories and Storytelling Magic. It explains how and why telling stories will enhance your magical performances. It will show you where to find stories that will complement your effects. There are hints and tips on delivery, timing and simple acting techniques that will improve your performances by up to 80%!. Finally, I have been asked by the publisher (Leaping Lizards Magic) to include the entire text of my previous work. "Kismet - or The Enchanted Stepping Stones!" (Still receiving amazing reviews - see the latest by David Goodsell in the May/June issue of "Oracle"). This I have agreed to do. So you will have two major books in one about a subject of which little so far has been written!" ‘MAGICTALES’ – The Definitive Book of Storytelling Magic! Is a collection of magical routines with entertaining story presentations that YOU WILL PERFORM! No pipe dreams! - No difficult moves! - No complicated apparatus! Order your copy NOW, to do so click HERE. BUT WAIT..... Latest 2012 news, There is now a 'Magictales Collectors Edition' containing both the first 'Magictales' and the latest 2012 released 'Magictales Two' book. Review #1. by Larry White. Sadly, I have just closed the final pages of a book I have anxiously awaited, MAGICTALES by Leslie Melville. I closed the last page sadly because I wanted this book to go on forever! Regular readers of Shadowland will remember my ultra-enthusiastic review of Leslie’s “ KISMET.” Here Leslie used one simple mathematical “puzzle” to create a variety of highly commercial and entertaining “playlets.” Using mostly the same props, KISMET contained routines for children, mixed audience and adults. All having been meticulously honed over many years of performance. Were I still performing I would have added ALL of the KISMET routines to my shows immediately. Well, now you can have KISMET and much more. You see, the final 64 pages of MAGICTALES contain the entire text of KISMET! If you are looking for new tricks, new gimmicks or original magical inventions you will not find them here. Leslie prefers the old, tried-and-true, tricks most magicians cut their teeth on: Flexible Glass, Twentieth Century Silks, Thumb Tip, rope tricks, Mirror Glass, Egg on Fan, Linking Safety Pins, etc. (But I will say there is one that was new to me. A very clever use for a Ken De Coursey trick). The upside of this is that this means you probably own the props for the tricks already and all you have to do is dust them off and redress them a bit. This book isn’t about tricks anyway, it’s about how to wrap tricks in fantastic storytelling tales. And Leslie Melville is an absolute genius at doing just that! A WITCH, A PILL AND A BOTTLE - This uses the De Coursey trick mentioned above. In brief, a ball is shown that won’t fit in a bottle. A silk is draped over the top of the bottle and the ball is set on top. The silk is pulled aside slowly and the ball drops into the bottle. Simple, yet Leslie’s story, all in rhyme, is played for fun and with facial expressions and acting (all described). This would have me laughing in the aisle. ACHMED’S TERRIBLE TEMPTATION – The 20th Century silks illustrate this irresistible tale of a young prince’s love for a 15 year old girl. While waiting for her to reach marrying age he sends her a yearly gift. The gift is carried to her by Ahmed and… well, you’ll just have to buy the book to find out what happens <G.> I choose this one to mention because of it’s description of the 20th Century Silk effect itself. Bill Thompson, proprietor of the House of Secrets and a superb illustrator, has drawn step by-step pictures of how to make and fold the silks. Bill Thompson’s creative drawings and descriptive illustrations are scattered throughout the book and add clarity to the text. PAINLESS PARKER AND THE NECKLACE TO TEETH – Don’t you just love that title? Painless was a dentist that plied his trade in the old west in the nineteenth century. He was a P.T. Barnum type character who changed his first name to “Painless” so he could advertise that way, although his techniques were far from painless. He collected the teeth he pulled and eventually made them into a necklace. Got the idea? WHICH CAME FIRST? – Is an original story/routine for the Egg on Fan. Rather than describe the clever story I want to mention that Leslie includes detailed instructions for preparing the egg skin. Instructions, written from experience, for this process are difficult to find, and again Bill Thompson’s illustrations aid the reader. "A YOUNG MAN’S MEETING WITH DEATH"
"HOW TO EXORCISE A VAMPIRE"
"THE STRANGE TALE OF MR. TALL AND MR. SMALL"
"THE FRIENDLY WITCH AND HER LINKING PINS"
"THE BLUSHING PALMS OF SAMOA"
"YOUR HAIR WILL BE YOUR FORTUNE"
"THE MIRACLE OF THE POINSETTIA"
"POSSESSED – PLUS THE FLIGHT OF THE LITTLE YELLOW POM-POM"
But wait! There’s more! The center 16 pages of MAGICTALES is titled "LET US TALK ABOUT STORIES AND STORYTELLING." This is a discussion about how and why stories will enhance your magical performances. Leslie has been a magic-storyteller since the mid 1960’s and he has performed thousands of times in the U.K. He knows this business inside-out and he’s a master at it. His thoughts on storytelling magic are golden. This section of his book should be read by everyone with a similar performing inkling. On this webpage you can also download a PDF sample which includes "A YOUNG MAN’S MEETING WITH DEATH" and "HOW TO EXORCISE A VAMPIRE". To sum up in just three heartfelt words: BUY THIS BOOK! More reviews can be found on the internet. To read all about 'Magictales Two' [released 2012), click HERE. To read all about the 'Magictales' Collector's Edition, click HERE.